Looking for the best crushed ice maker or an ice shaver for your home? In the following in-depth buying guide, I’ll review the best-crushed ice and shaved ice machines you can buy online. There are many different types of ice crushers - everything from simple & cheap manual ice crushers, to shaved ice machines for parties, to commercial electric crushers that can crank out ice in volume. In this guide, I've selected the best in several categories to help you find the right one for your needs. I’ve also included a few specialized machines for commercial ice crushing and making snow cones. What's In This Crushed Ice Maker Buying Guide? Where To Get The Best Deal on a Crushed Ice Maker? A manual ice crusher is great if you want to be able to enjoy crushed ice at any time wherever you are. 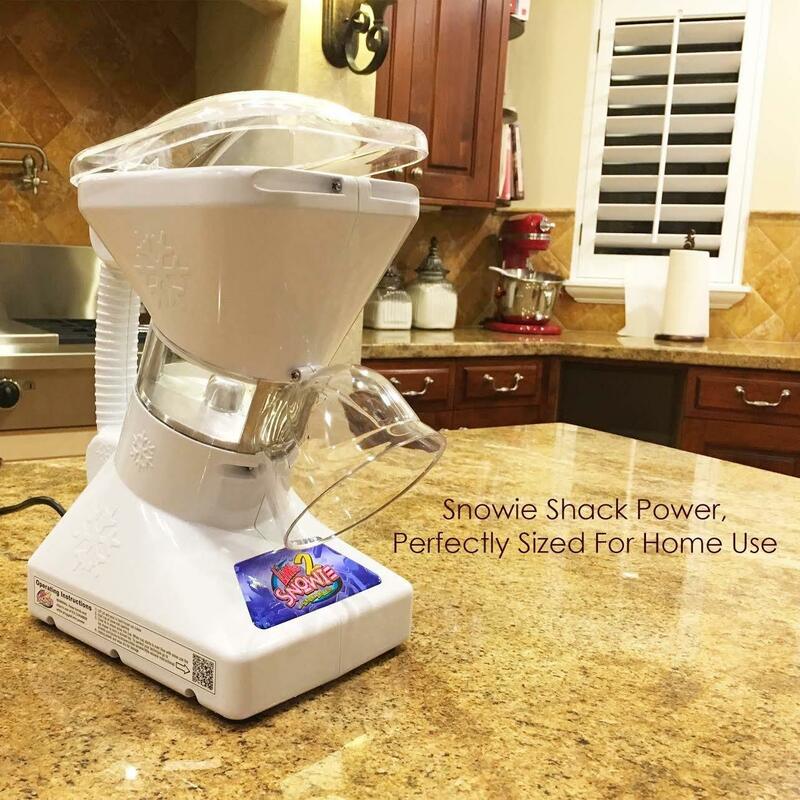 With a hand crank crusher like this one from Innovee Home, you don’t need any electricity to make crushed ice. 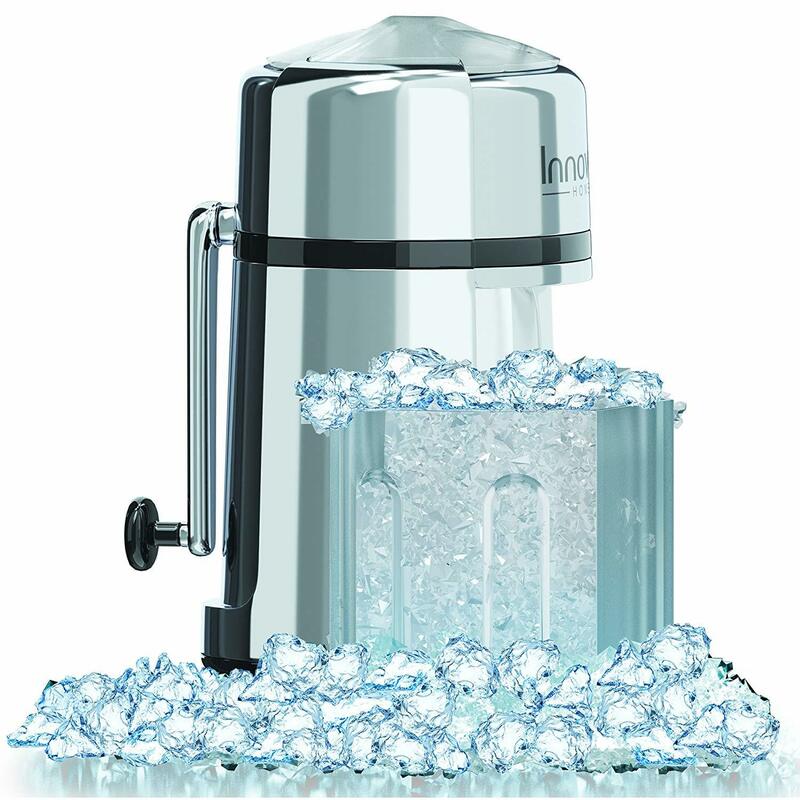 Simply add any size of ice cubes to the crusher, turn the crank, and crushed ice quickly fills up the large ice bucket. It’s great for kitchens and wet bars. Since it’s easily portable and doesn’t need a power connection, you can also carry it with you and enjoy crushed ice on the go. 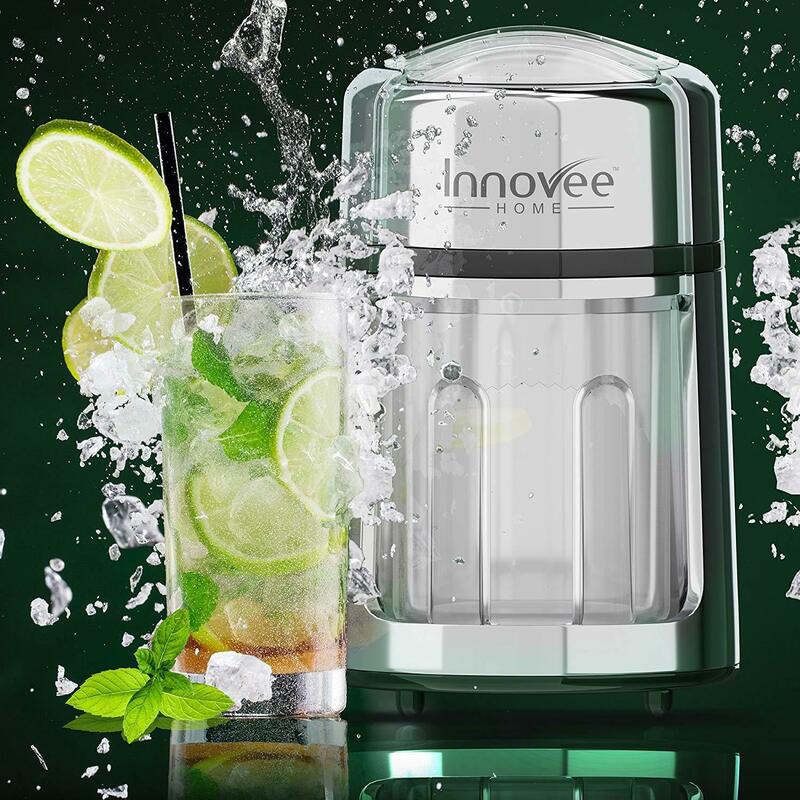 Note: The Innovee manual ice crusher produces crushed, not shaved, ice. If you’ve been thinking about getting one of those cheap plastic ice crushers, don’t. They may save you some money, but they don’t last long before cracking. You need something that can withstand the repeated stress of crushing hard chunks of ice. 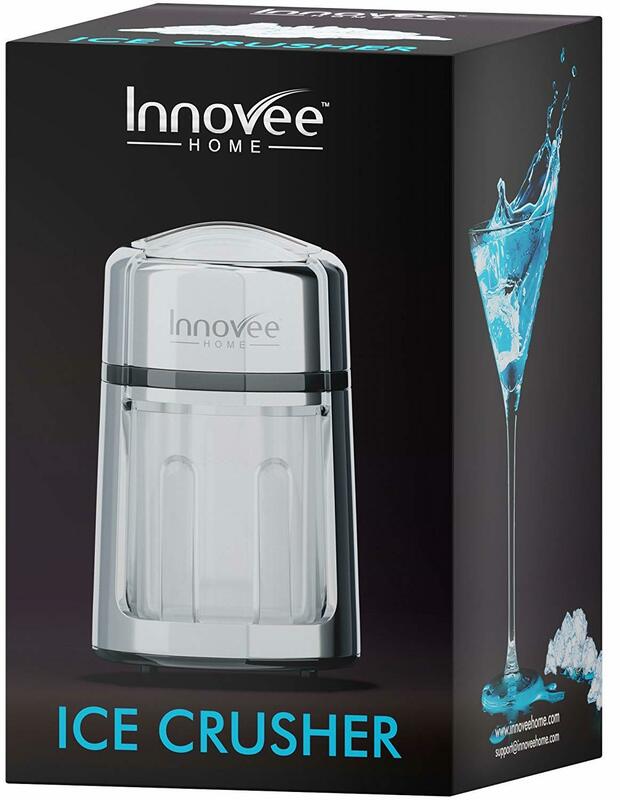 The Innovee manual ice crusher is perfect. Complementing the zinc alloy construction are stainless steel blades that cut through ice like butter. The blades are strong and super sharp (don’t dare touch them with your bare hands!). They can crush ice into fine bits that are perfect for cocktails, margaritas, and other mixed drinks. Since they are stainless steel, you don’t have to worry about any rust on the blades. The hand crank takes little effort to turn. It requires just about the same effort as rolling up a crank car window. So if you are buying this crusher for your aging parents, you can be sure they won’t struggle to use it. The base of the ice crusher is fitted with non-slip legs to provide a strong grip on all kinds of surfaces. Just a firm hand on the machine as you rotate the crank is enough to keep it in place. You don’t have to hold it in a tight grip. The non-slip legs are especially helpful for smooth surfaces like marble or tile counters. You can crush around 2 cups of large ice cubes before you need to empty the ice bucket. This allows you to prepare enough crushed ice to fill multiple drinks at a go. The large capacity is handy when you have guests or when you are preparing smoothies for the entire family. An ice spoon is included along with the ice crusher. One concern from customers is that ice cubes sometimes get jammed in the crushing mechanism. But this is an easy problem to solve. Don’t force the blade through the jammed ice. Instead, jiggle the ice crusher to get it going again. Another issue is that part of the crushing mechanism is made from plastic. If you crush lots of ice every day, the plastic bit will crack sooner. Shaved ice is better for certain sweet treats like snow cones and syrups. Compared to crushed ice which contains larger granules of ice, shaved ice is light, fine and fluffy. 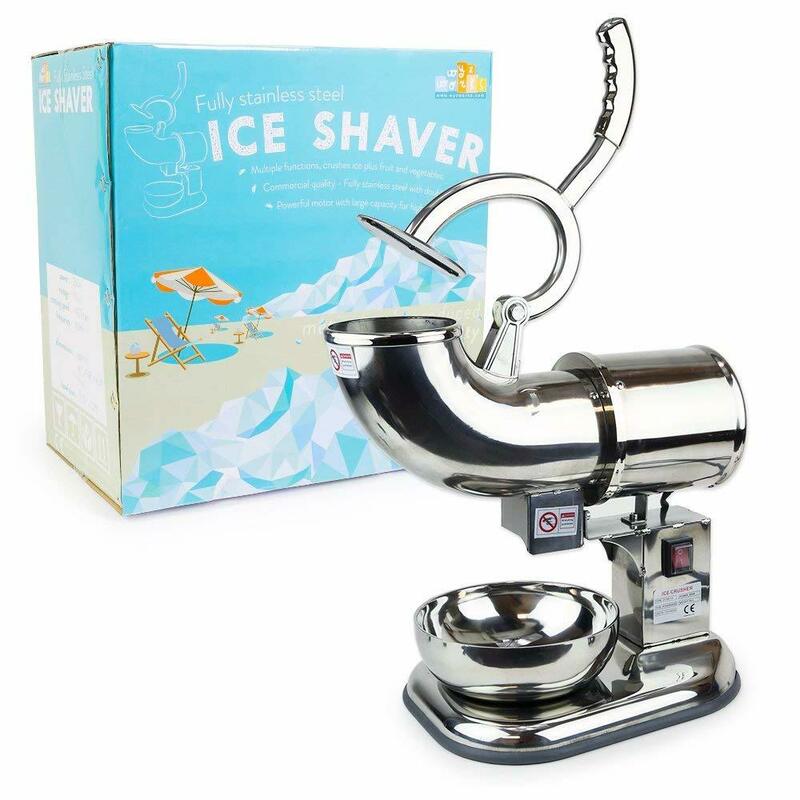 If you prefer shaved ice to crushed ice, I recommend the F2C tabletop ice shaver machine. It’s fairly large, but it can handle lots of ice, around 200 lbs an hour. It’s perfect for kitchens, commercial bars, parties and events, entertainment venues, boats, and RVs. It’s also super easy to use, and you can select how thick you want your shaved ice to be. With the capacity to shave up to 200lbs of ice an hour, this ice shaver is not just for home kitchens. It can easily keep up with demand in a bar or large event. At home, it’s perfect for large families. The machine shaves ice using stainless steel blades. They are extra-sharp to improve efficiency and make sure the ice comes out in the right size. Just be careful when cleaning them. Don’t touch them with your bare hands. Use a soft cloth instead. Note: Even though the steel blades are strong and sharp, the manufacturer recommends pre-crushing big chunks of ice to avoid breaking the motor. The recommended ice cube size is 2-5cm. Using a thin-thick dial on the machine, it’s easy to select your preferred ice size. The machine then adjusts the blades to shave ice into the selected size. Crushing big chunks of ice is no easy task for a machine. The process is violent, noisy and creates a lot of vibrations. 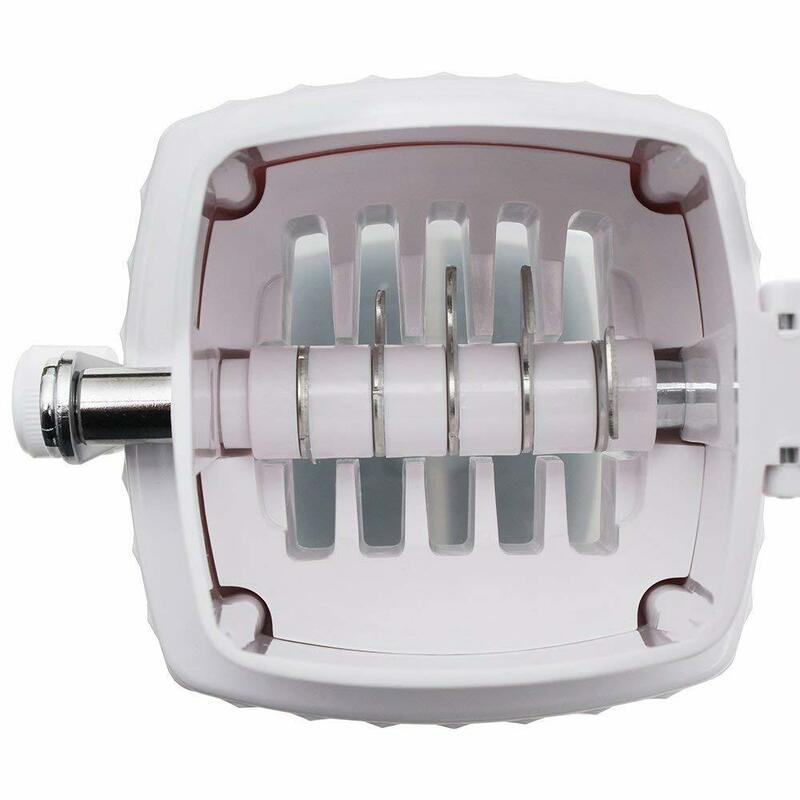 To keep the machine as quiet as possible and to avoid shaking, the manufacturer designed this shaver with a low center of gravity. Even with the blades spinning at 320 rpm (the max rotation speed), the shaver stays stable on the counter with minimal vibrations. Another design aspect that helps keep it stable is the set of rubber feet underneath the machine. They are especially helpful when you are using the shaver on a smooth countertop. You don’t have to worry about it sliding around and potentially falling off the counter. The main concern with most customers is that the ice shaver leaks water after you finish using it. This is caused by bits of ice left behind which begin to melt. It’s not a big issue, and it doesn’t damage the machine, but it can leave a pool of water on your counter. An easy solution is to place an absorbent towel under the ice machine and leave it there even after you are finished using it. An electric ice crusher has several advantages of a manual one. The biggest one, obviously, is that you don’t need to apply any effort to enjoy crushed ice. Just add your ice cubes to the machine, plug it in and turn it on. A motor does all the work for you. This is handy if you cannot, for one reason or another, be able to operate the hand crank on a manual crusher. It’s also the best choice if you need a lot of ice maybe for an event or a bar. One of the best electric ice crushers is this one made by Costzon. It works fast, can handle 26.5 lbs of ice per hour – and you can use any size of ice cubes. It also looks quite stylish on the kitchen counter with its sleek modern design. Note: This machine only makes crushed ice. The Amazon description says it can make shaved ice and snow cones, but it has only one setting for crushed ice. 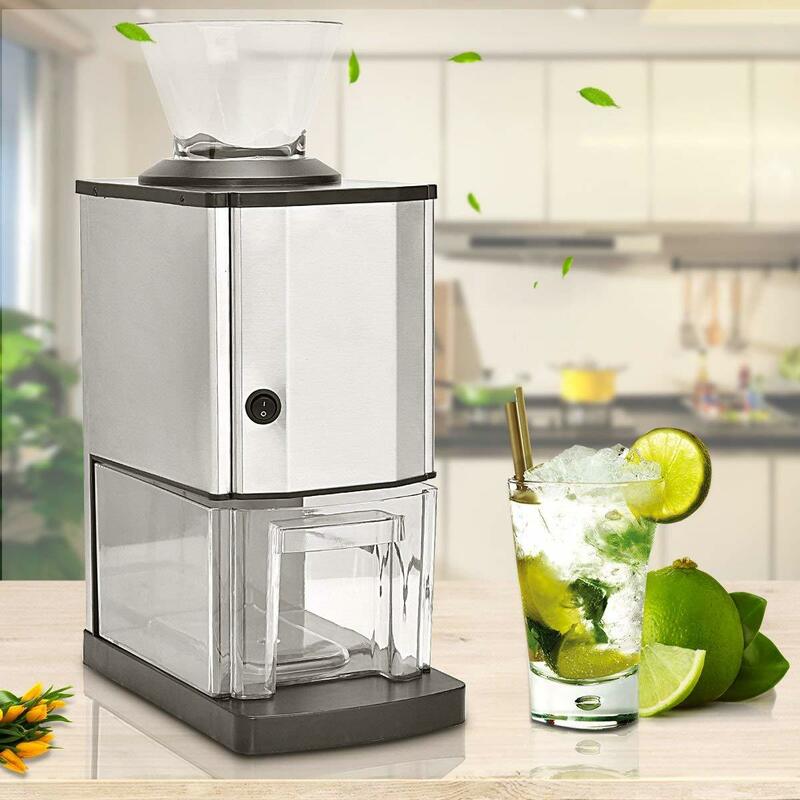 This ice crusher handles all ice cube sizes without any problem thanks to the heavy-duty motor and sharp stainless steel blades. You don’t have to pre-crush the ice before putting it in. The machine can crush around 26.5 lbs of ice per hour. That’s enough for a large family or even a business like a bar or a restaurant. The ice bin can hold up to 12 cups of crushed ice; plenty enough to meet the needs of a large family, event or bar. The bin is transparent so you can easily see how much ice it contains. But it doesn’t come with a scoop. So make sure you have one on hand. A plastic one is good enough for scooping the crushed ice. 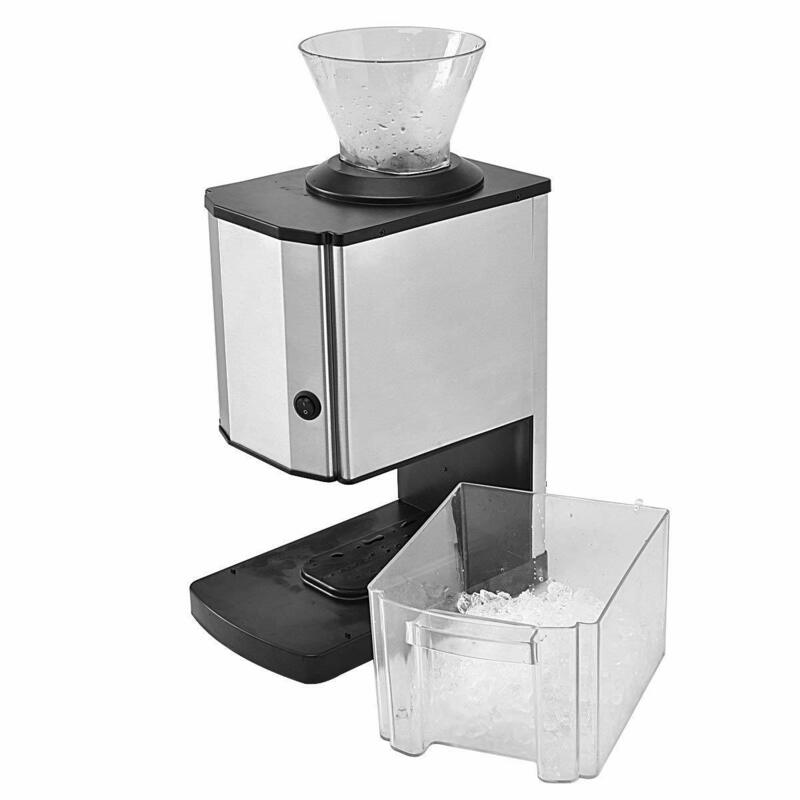 The ice crusher is​ easy to use even if you’ve never used an ice crushing machine before. One of the convenient features is the funnel-shaped ice chute at the top. This makes it easy to add ice cubes to the machine. Several users recommend adding a few ice cubes at a time to keep the machine from jamming. I also love that you don’t have to open or unscrew anything to get the crushed ice. Simply slide the bin from under the crusher. The silver finish combined with the clear ice bin and the black base looks sleek and modern. It’s a great addition to your kitchen or bar counter. It’s a compact machine measuring just 6.7’’L x 10.5’’W x 18.1’’H. It takes up very little space on the countertop. 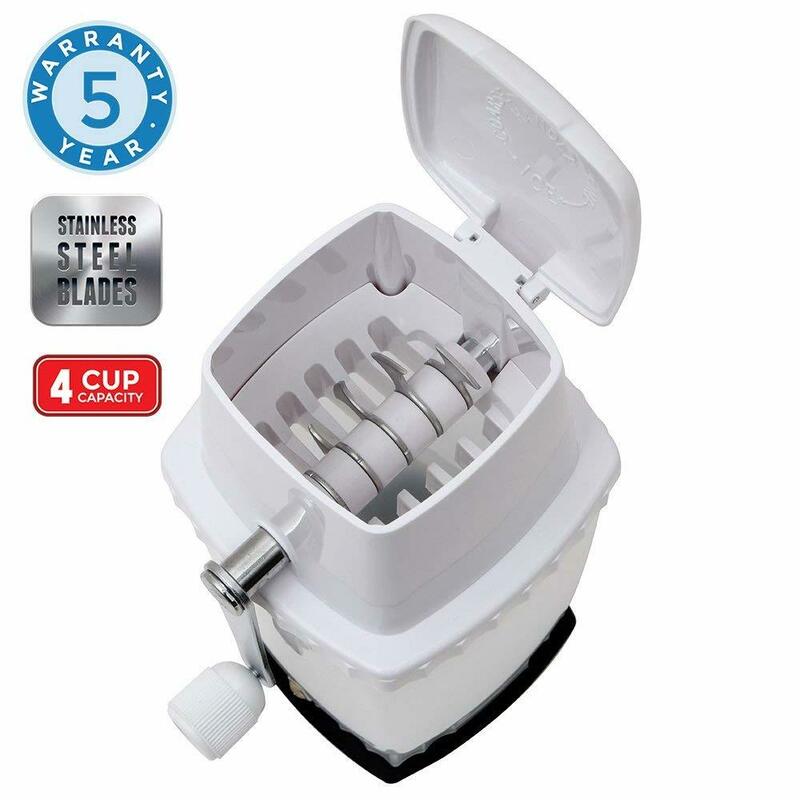 So if you are thinking about getting a compact ice crusher for your boat or RV, this one is a great choice. The Costzon ice crusher is a tad noisy. This is understandable considering the heavy-duty motor and blades but get ready for a bit of a ruckus in your kitchen. I suggest using it during the day when it will be less disruptive. Another issue several customers pointed out is that the company advertises it as an ice crusher/shaver. This is a bit misleading. As I mentioned, it only crushes ice. If you are looking for an ice shaver, I’ve included a couple of them on this list. 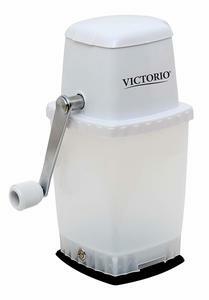 If you don’t have a big budget to spare, I recommend this portable hand crank ice crusher made by Victorio. It costs less than 30 bucks but is good enough for most people’s needs. 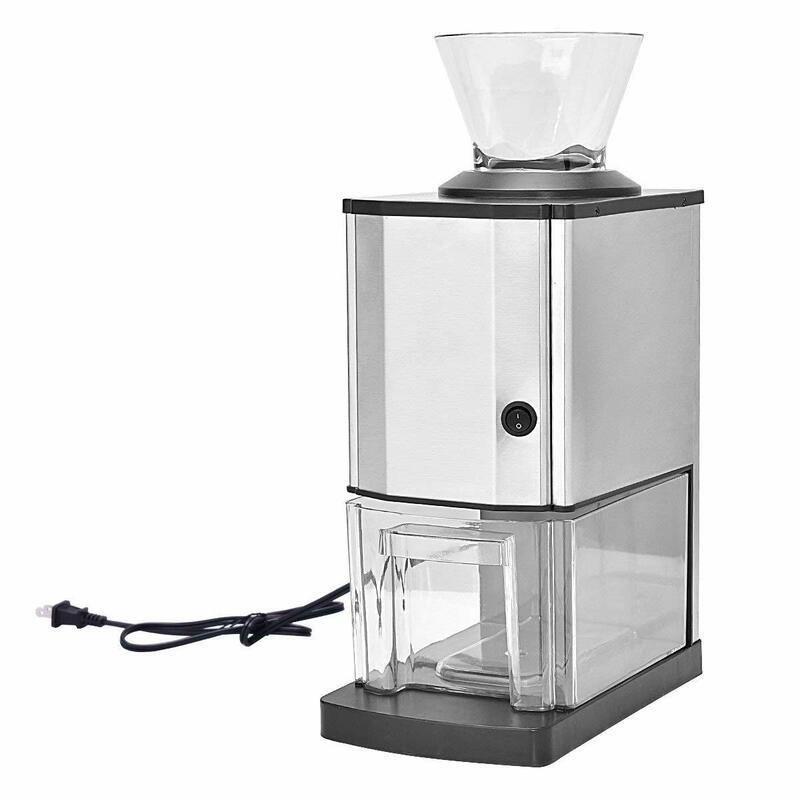 It’s small (obviously), but unless you are looking for an ice crusher for an event or bar, this one will do. The bin holds about 4 cups of crushed ice, which is actually a lot for a crusher of its size. It doesn’t take a lot of effort to turn the crank. It has a neat trick where you can change how fine or coarse the crushed ice is simply by changing the turning direction of the hand crank. Compact kitchen appliances are always welcome especially for those of us with limited space to spare on the counter. They also make for excellent additions to a wet bar, an RV or boat. 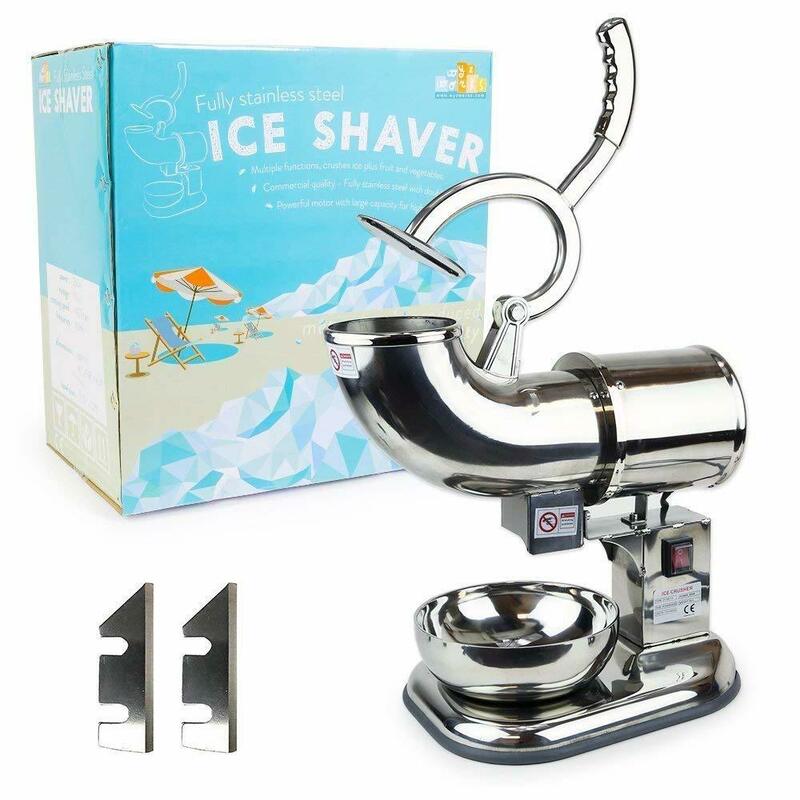 You can also carry the ice crusher with you on the road when camping or enjoying an outdoor party. It’s manual, so you don’t need to connect it to an outlet. Despite its size, the Victorio manual crusher can handle most ice cube sizes. Don’t bother pre-crushing the ice before adding it to the hopper. The sharp blades can handle the ice cubes as they are. They can crush the ice into one of two sizes. To select your preferred size, just turn the crank in a specific direction. Turn it clockwise for finely crushed ice and counterclockwise for coarser ice. Operating the crank is fairly easy thanks to the sharp blades. This ice crusher comes with an extra level at the bottom. Its work is to secure the base to the counter surface using strong suction force. This prevents the machine from sliding around when you turn the crank. You just need to turn the lever counterclockwise to secure the base. The crusher comes with a surprisingly large bin for its size. The bin can hold around 4-5 cups of crushed ice, which is enough for most families. It’s slow. It takes more than 10 minutes to fill two glasses with crushed ice. If you are thinking of using this to serve a whole party, you should probably consider an electric ice crusher instead. The other issue is the suction base. It doesn’t always work which means you sometimes have to hold the machine firmly to keep it from moving as you turn the crank. There is also the issue of longevity. Being budget ice, I don’t expect it to last more than a couple of years especially if you use it every day. Most of it is plastic which is vulnerable to cracking. 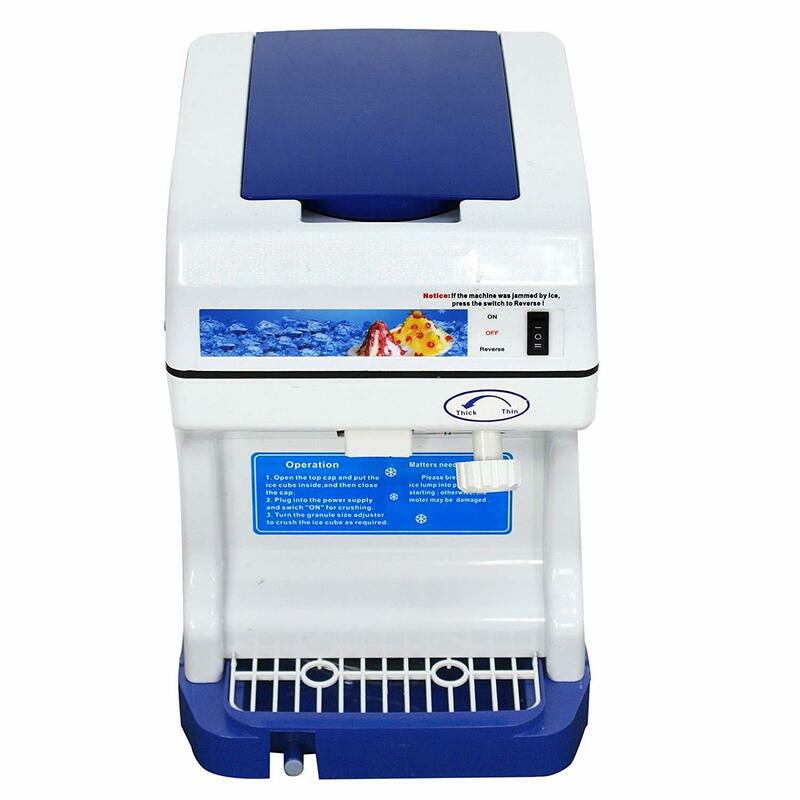 If you are a snow cone vendor or need lots of shaved ice for your business, get this heavy-duty commercial ice crusher & shaver. It’s the weirdest looking ice crusher on our list, and it’s also the strongest. The super sharp blades pulverize ice cubes into fine, fluffy snow though you can also adjust the size to get crushed ice. The machine can shave up to 440 lbs of ice per hour. Whether you are making snow cones, syrup or other shaved ice treats, the WYZworks doesn’t struggle to keep up with demand. One of the reasons this ice crusher looks so weird is that it’s almost all-steel. It doesn’t have any visible plastic part. The hopper where you add ice cubes is stainless steel. So is the main casing, the base, the blades, and even the bowl. In most ice crushers, most of the parts are plastic, and they break sooner or later. This WYZworks crusher is designed to last for years without breaking or cracking. There’s really little to break, after all. This makes it an excellent choice for commercial use. It can withstand heavy daily use without damage. But it’s not just for snow cone vendors and bartenders. If you are looking for a durable ice shaver and crusher for your kitchen, the extra cost is worth it. Just because it is a commercial ice crusher doesn’t mean that it’s difficult to use. In fact, it only has one button for on/off. You use the stainless steel handle to get the machine started. As soon as you press the handle down, the stainless steel bowl starts filling up immediately. The force you apply on the handle determines whether the ice comes out fluffy and fine like a snow cone or in small granules like crushed ice. 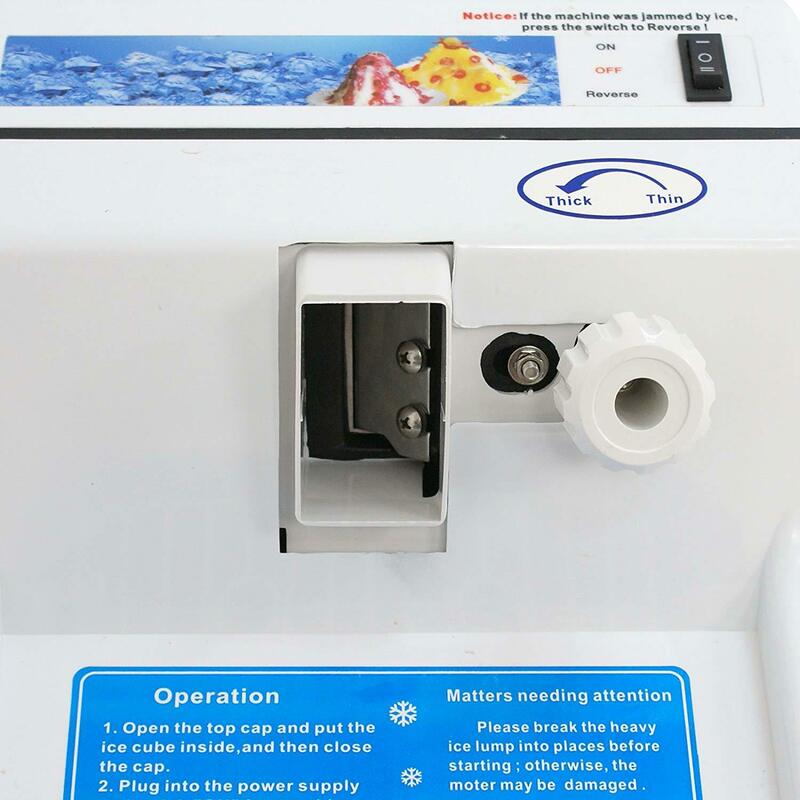 This machine uses two removable stainless steel blades that can be removed for easy cleaning. The package includes two extra blades just in case the current ones get damaged, and you need replacements. The only sort of concern is that the machine is too fast. Seriously. Shaved ice comes out faster and in bigger amounts than you expect. The bowl fills up in less than a minute. You’ll need someone to turn the bowl as you press down the handle. This keeps the ice from accumulating too much in one place and spilling over. The WYZworks commercial ice shaver machine I’ve reviewed above is pretty good for snow cones. 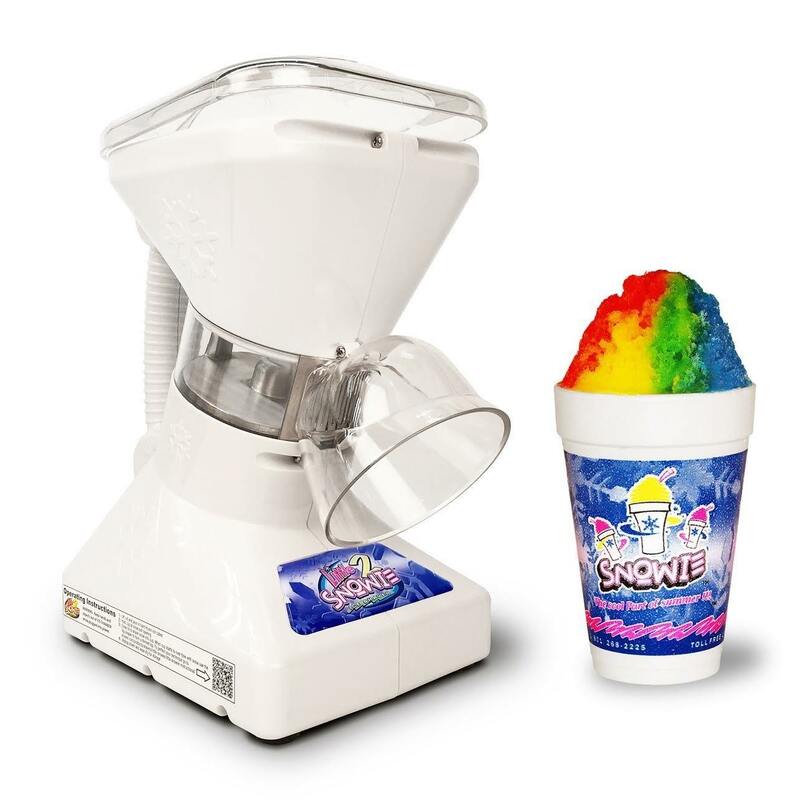 But if you want a dedicated snow cone maker, I recommend the Little Snowie 2. 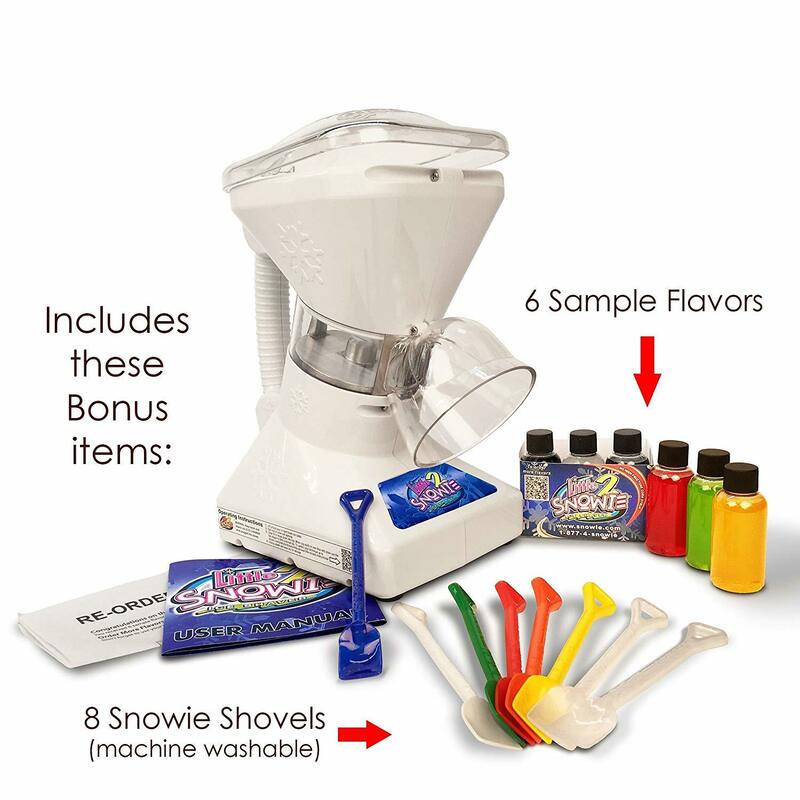 The little Snowie is designed specifically for making snow cones. Even the outlet where the shaved ice comes out is funnel-shaped to fit a snow cone cup. It makes a full snow cone in just 3 seconds. The shaved ice is Hawaiian-grade. It is super fine, fluffy and melts easily in your mouth. The Little Snowie 2 is great choice for homes with kids, home parties and small snow cone vendors. Little Snowie 2 feels surprisingly light and looks compact but rest assured that it’s strong enough to withstand years of use. The company says that the blades will make over 1,000 snow cones before they need replacement while the motor can ​make 100,000 . You’ll be using it for many years to come. When you are serving a party or a riot of excited kids, you can’t keep them waiting forever for their snow cones. Little Snowie keeps things going by making a snow cone in just 3 seconds. For extra-large events, you can easily serve dozens of people without breaking a sweat. The shaved ice this unit makes is not as fine as what you get from a traditional block ice shaver. But it’s better than anything you’ll get from any other home ice shaver. It’s almost as good Hawaii’s famous snow cones. It’s fine, soft and fluffy. One thing I love about this snow cone machine is that it’s not choosy about the kind of ice you can use. You can add any size and shape of ice to the machine, whether from your fridge or store-bought. Then press a button and stick a cup against the funnel outlet. The outlet works with different cup sizes. But larger cups are best. The funnel has a curved design that creates a nice ice mold on top of the cup to create the perfect snow cone. Snowie, the manufacturer, also makes snow cone syrups. This ice shaver comes with six free sample-size bottles of their most popular syrup flavors. With an extra-strong motor that makes a snow cone in seconds, you can expect a lot of noise. You won't notice it much if you are using it at a party or outdoors. But if you are making snow cones inside, it’ll take some time before you (and your pet) get used to the noise. The most basic way to crush ice at home is by putting it in a plastic bag and smacking it using a wooden mallet or baseball bat. It might work, but there are much better and easier options to crush ice at home. They are not only easier to use, but they also produce better-crashed ice for your drinks. Here are the three best ways to make crushed ice at home. If you don’t want to spend a lot of money on a fancy electronic ice crusher, a manual one will work fine for home use. A manual ice crusher consists of a crushing mechanism where you add ice cubes, a hand crank that operates the blades and an ice bucket where the crushed ice falls. You have to turn the hand crank to crush the ice. The obvious downside of this method is that you have to operate the ice crusher manually. It’s not that hard to turn the hand crank, but it can get tiring if you need lots of crushed ice. It’s also slow. The upside is that you can make crushed ice anywhere and anytime since you don’t need to be near a power outlet. Most annual ice crushers are also small enough that you can carry them on road trips, when going camping and to outdoor parties. Electric crushers are the best if you use a lot of crushed ice at home or in the office. You don’t have to do any work, and you can prepare a lot more crushed ice in just a couple of minutes. Electric ice crushers work pretty much the same way as manual ones. There’s a crushing mechanism consisting of sharp steel blades and a bin to collect the crushed ice. But they are often bigger since they also contain a motor and a large bin. There are different sizes of electric crushers from compact ones that take little space on your counter to large ones that are ideal for businesses and vendors. There are also different types. 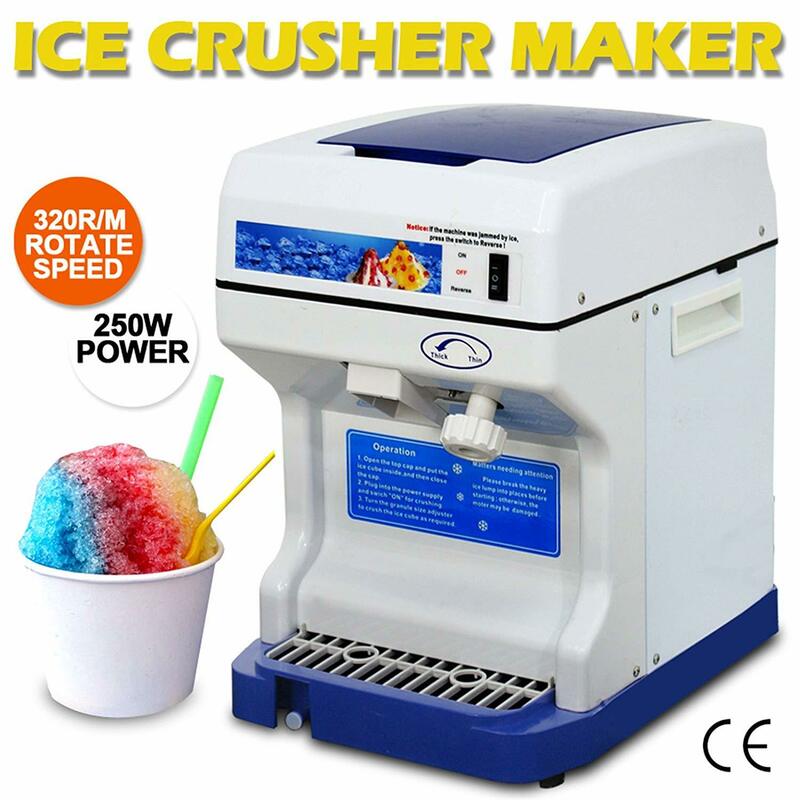 There are those that produce crushed ice only and others that can make both crushed and shaved ice for snow cones. Many fridges that come with built-in ice makers produce normal ice cubes. But there are also brands that can make crushed ice. To do this, they incorporate blades within the ice dispenser mechanism to crush the ice. If you are shopping for a new fridge, this is definitely a feature to look for if you love crushed ice. If you are not planning to replace your fridge, it’s cheaper just to get an electric ice crusher. Note: There are many blenders that can crush ice, although they typically will not do as good a job as a dedicated electric ice crusher. That said, unless the manufacturer specifically says you can crush ice with their blender, do not try as it can damage the blades and plastic jar. Same goes for food processors. Is crushed ice the same as sonic ice? Sonic or nugget ice refers to extra-soft, and easily-chewable ice nuggets made using a sonic ice machine. You can also get the ice ready-made from a Sonic drive-in. ​Learn how sonic ice is made. Crushed ice is normal ice cubes that have been crushed into fine pieces using one of the methods described above. If you want to make Sonic Ice, then use a specialized ice maker like the budget-friendly GE Opal or buy one of Scotsman's higher-end sonic ice machines. How do you crush ice without a blender? Use a hand-crank manual ice crusher or get an electric ice crusher. You can also check whether the ice maker in your fridge has a crushed ice option. If you can’t use any of these three methods, you can also crush ice by putting it in a bag and hitting it with a blunt object like a mallet. But the results won’t be as good. If you use crushed ice a lot at home, it’s worth it to invest in a good manual or electric ice crusher. How is ice created in ice makers? It depends on the type of ice. The process is different for normal bullet-shaped ice, clear gourmet ice and sonic nugget ice. Learn how different types of ice are made - sonic, clear, gourmet, etc. What are the best brands of ice makers? If you are looking for a portable ice maker, some of the most trusted brands include Della, Luma Comfort, and Igloo. If you are thinking about buying getting an under-counter or freestanding ice maker for your home and business, the best brands include Scotsman, EdgeStar, Whynter, Ice-O-Matic and SPT. These brands make different ice machines for clear ice, normal ice, and sonic ice. What is the best portable ice maker? It depends on your budget and ice-making needs. Read our best portable ice makers guide to learn about the best ice machines in this class. 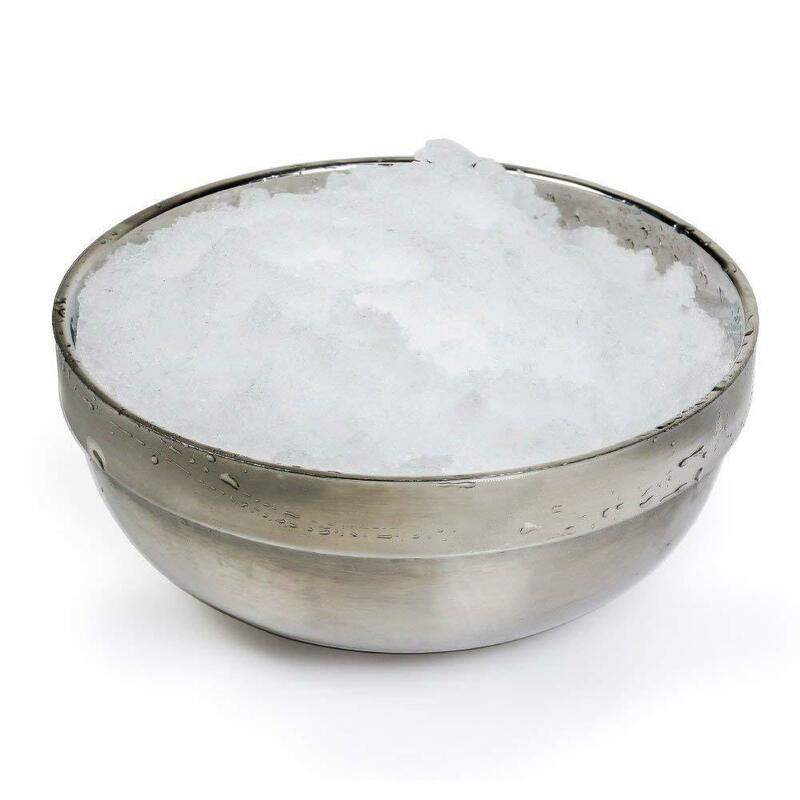 What are frequent home uses of crushed ice? Crushed ice is often added to a variety of sweet drinks like smoothies, slushies, margaritas, cocktails, and Daiquiris. Basically drinks where quick dilution is not a problem. Crushed ice can also be added to food platters to keep certain foods like sauces and salads fresh and chilled. 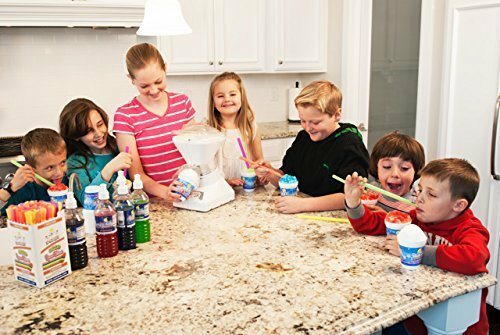 Amazon.com and Walmart.com usually have the best deals on crushed ice makers and shave ice machines for the home. Commercial ice makers are often sold through local restaurant supply stores, although Amazon is now carrying a wide variety of units. IceMakersHub is a participant in the Amazon Services LLC Associates Program. This is an affiliate program through which we earn fees by advertising and linking to products sold on Amazon.com. However, this does not increase the prices you pay for products.